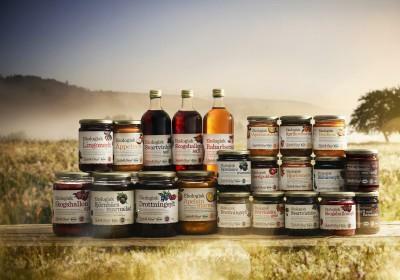 Mercadero represents Torfolk Gård, a Swedish supplier of organic jam, spread and cordial made with wild berries. Torfolk Gård has a long tradition of organic production. This organic farm and small scale producer of processed fruits was founded in 1977 with a vision of producing better food. Torfolk products are made with only natural ingredients (100% natural and organic). All products are organic certified by KRAV. There are no additives such as concentrates, and only small amounts of acids and pectine (all less than 1%). All products have high levels berry content giving the product its natural true taste. It is not a diet jam, but its sugar content compared to other brands on the Dutch market is rather low. Each jar is a personal touch from the producers. Torfolk uses wild berries from the Swedish forests in the county of Värmland, close to the Norwegian border. The strawberries are cultivated in the Torfolk Gård farm. Blackberries and raspberries are from Bosnia, where cultivating berries and picking wild berries is a traditional practice. While building up the war-torn country again, the wild blackberries and raspberries are the first products that can be obtained. Torfolk Gård makes jam of blackberries, and jam as well as juice of raspberries. This offers the opportunity for the producers to rebuild their own business. Sustainable business both ecologically and economically.